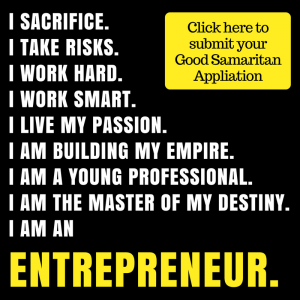 The Good Samaritan Project is intended to help an entrepreneurial young professional in the Waterford area market grow their business through the benefits of becoming a Waterford Area Chamber of Commerce member. Sponsored by the Waterford Chamber's Young Professionals Network, this project honors the mission of the Young Professionals; To provide a platform to attract, retain, support, and help grow the demographic of young talent to the Waterford Area Chamber of Commerce and community while developing the next generation of leaders and their businesses. The awardee will be chosen by the Young Professionals Committee based on the information provided in the applications submitted. The selected business will receive a complimentary one year membership investment with the Waterford Area Chamber of Commerce (value $225) utilizing all of the benefits given to any other member in good standing. During the year, you will be expected to attend the Young Professionals Network monthly meetings. In addition, we hope you decide to attend many of the other networking and professional growth opportunities. At the end of one year as a vested member, we believe you will understand the benefits and value of Chamber membership and renew your membership for yourself. Currently not a member of the Waterford Area Chamber of Commerce. Able to attend 9 out of 12 Young Professional Network Meetings during the year of your membership (April 1, 2018-March 31, 2019) Meetings take place on the second Wednesday of each month at the Oakland County International Airport. Must be a young entrepreneur at a for profit business. At the end of the one year membership, write a short testimonial of how being a member of the Waterford Area Chamber of Commerce is beneficial.